Good beginner motorcycles are important in a developing market like ours. Not only do they allow newbies to acquire new skills, but they also aren't a handful to keep in control. So as ham-fisted as a new rider may be, a fast yet friendly motorcycle is like the good teacher who never leaves a student's hand as he/she moves up the learning curve. 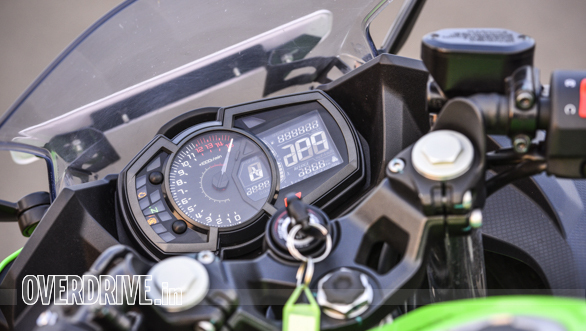 The Kawasaki Ninja 400 belongs to this category of fast yet friendly beginner motorcycles, but at the same time promises to offer enough thrills for those riders who've climbed up the ladder. So, what makes it tick? Pictures don't do justice to the Ninja 400 as the bike looks much bigger in flesh. There's a nice mix of design languages that have trickled down from the Kawasaki Ninja H2 and the ZX-10R flagship superbikes. The sharp fairing, with the H2 inspired fangs and the twin LED headlamps lends the right amount aggression to the face. The side panels have their own set of creases, albeit hidden to some extent by the black paintwork, but the bold decals along with the bright green and yellow stickers do liven up things. 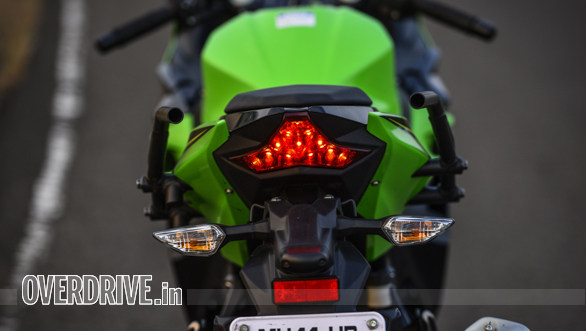 The tail section is sleek and minimal while the triangular tail lamp seems to have been lifted straight off the ZX-10R. 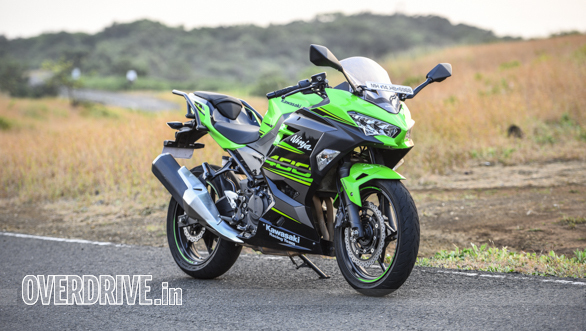 The overall design is attractive and this special Kawasaki Racing Team (KRT) colour scheme ensures everyone notices the bike. The instrument panel has a negative LCD display that looks premium and I like how the analogue tachometer seems to take pride of place. Honestly, despite this being an age of all-digital displays, there's a certain feel good factor about watching a tacho needle swoop to the redline, which in this case begins at 12,000rpm. The quality of the paint, switchgear and panels feels top notch and there are no complaints when it comes to fit and finish. The Ninja 400 is as well built as its stablemates, north of its price point. For a bike that looks like a focused track bike, the ergonomics are actually pretty relaxed and comfortable. Though the footpegs are rearset, the clip ons are high which is far from the uncompromising, foetal position that one might expect. 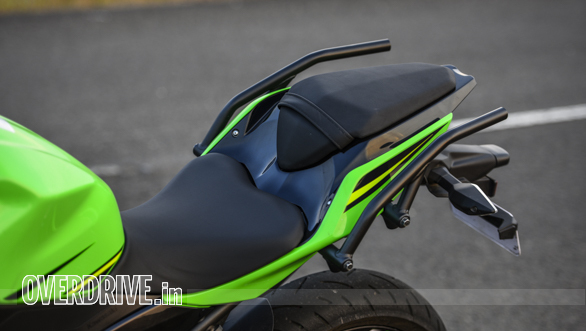 Also, the low, 785mm seat height makes this Ninja accessible to a wide range of riders. Track or tour, the Ninja 400 has ergos that fit both. The only gripe is the lack of adjustable levers, considering the price, which I'll get to later. 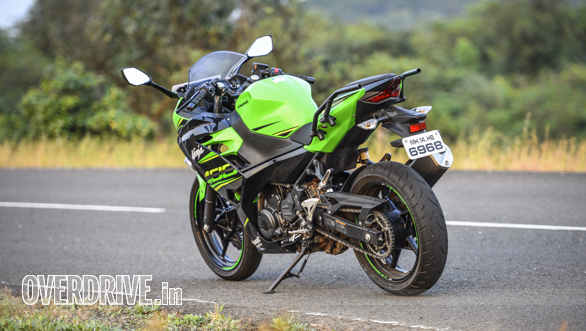 The new 399cc, liquid-cooled, parallel-twin motor makes 103cc more than the Ninja 300's engine, on which it is based. The compression ratio too has been raised to 11.5:1 and as A a result, there's a bump in power and torque. The motor produces 49PS at 10,000rpm and 38Nm at 8,000rpm respectively. Thumb the starter and the engine feels very refined at idle with barely any vibes creeping in through the bars or the pegs. 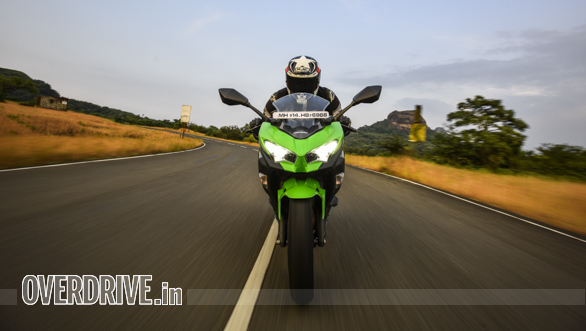 Once you get going, the bike surges ahead as you roll on the throttle. 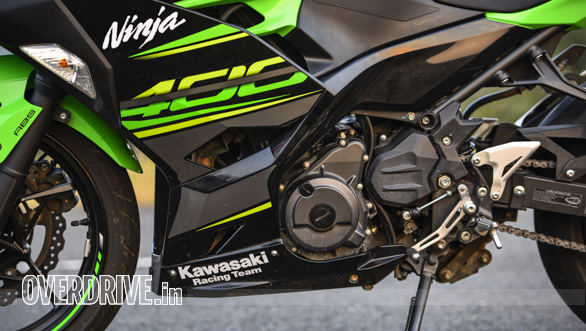 Power delivery is crisp and linear and what helps is generous amounts of torque in the low and mid range, unlike the Ninja 300's engine that is always hungry for revs. What this translates to is great tractability, allowing you to pootle around town in high gears. 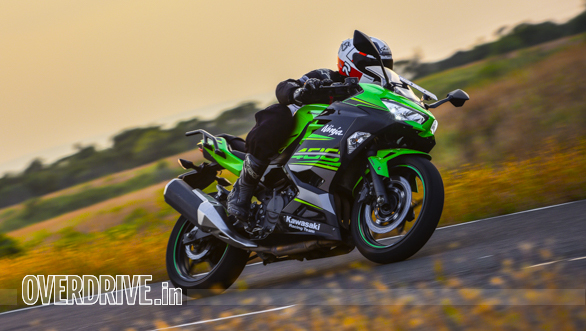 The Ninja 400, in fact, pulls cleanly from 40kmph in sixth gear so it doesn't really mind if the rider wants to just chill and ride. You can also peacefully cruise at 120kmph in sixth gear with the revs hovering around the 7,000rpm and that underlines the 400's ability as a touring machine. That said, this is a Ninja so the actual fun begins only past 7,000rpm. From then on there's a relentless surge to the horizon that quite frankly, is addictive. The 0-60kmph time of 2.45s and a 0-100kmph sprint in 5.4s tells the tale of just how quickly the bike accelerates, faster than any other bike in the segment. 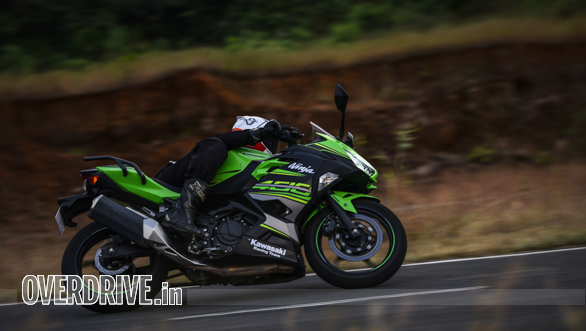 While the performance is astounding the Ninja also impresses with is fuel economy too. In the city, it returned 25.5kmpl while on the highway it delivered 32.4kmpl. The Ninja 400 employs an all-new tubular steel trellis frame that's stronger yet lighter than the 300's diamond type chassis. The front forks are also beefier, at 41mm while the Uni-track, gas-charged monoshock at the rear is adjustable for preload. For its intent, the Ninja 400's ride quality is pliant and it remains unfazed by potholes or undulations. Given its 140mm ground clearance, however, you might want to exercise caution over very tall speed breakers or even while tackling moon sized craters, especially when riding two up. Don't let the comfortable ride fool you though. This Ninja 400 is an absolute joy to ride around corners. The steering geometry, first of all, is sharper with a 24.7 degree rake and the short wheel base at 1,370mm makes it super flickable as well. But this hasn't come at the cost of mid-corner stability thanks to the longer swingarm. 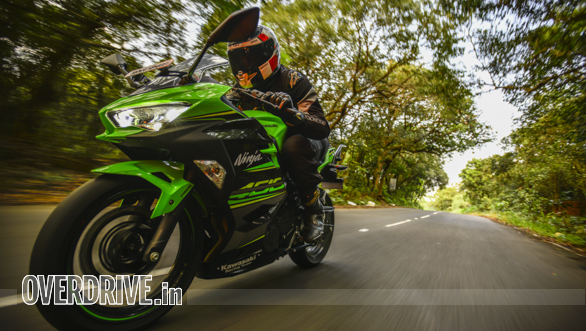 These attributes along with the feedback-rich chassis and Dunlop Sportmax tyres makes the Ninja 400 a poised and precise corner carver. The bike eggs you corner harder and harder, that's how communicative the bike is. I had a big smile on my face all the time and the confidence that this baby Ninja instills is what made it so much fun. 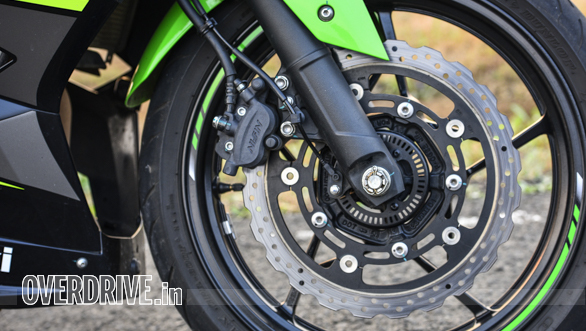 The 310mm petal discs and sem-floating Nissin calipers offer strong bite, helping the bike shed speed rapidly to come to a standstill from 80kmph in 3 seconds flat. There's good feedback and progression through the levers as well and the added safety net of ABS is like the gurdian angel watching over you. The Ninja 400 proves to be a fantastic beginner motorcycle and its friendly character allows riders of varying experience to simply hop on and go for it. It looks good, rides well on our roads and is comfortable over long distances as well. To me, the Ninja's handling is what appeals the most. I love it for the ease with which you can flow from corner to corner and it'll have your back and let you correct, a messed up cornering line. It's a motorcycle that I'd recommend to someone who'd like to develop riding skills but there's one caveat that stops me. The astronomical Rs 5.75 lakh (OTR Mumbai) price. At that lofty perch, the Ninja 400 is tantalisingly close to the Kawasaki Z650, another sweet motorcycle with a lot more power. 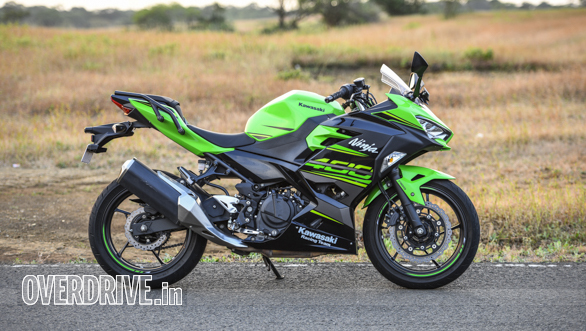 I really hope Kawasaki India finds a way to localise the Ninja 400's parts and drop the price significantly, by over a lakh at least. That'd make a really good bike, accessible.